This is the product of the latest of a number of projects I have carried out with school children. In order to achieve durable results and give children a first taste of woodcarving in a manageable form I use plywood as the material. The children design the card templates, then I use these to transfer the shape to plywood, whereupon I cut out the shapes with bandsaw and jigsaw. Back at school, the children experience several making processes: they apply a carved surface design with mallet and V tool, make smooth all edges and surfaces with file and abrasive paper, and finally paint the piece. When complete I take all the pieces back to my workshop and build the tree. 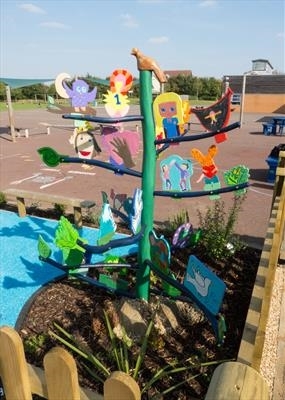 Due to changing circumstances at school I displayed the tree in a temporary base until the tree was installed when the memorial garden was built during the summer holidays. We did not anticipate that the deputy head would die when the project was planned in February.